In the 1970s, the Everson Museum of Art in downtown Syracuse created the first ever video department in any museum. At the same time, the Everson hired then recent Syracuse University alumnus David Ross ’71 to serve as curator for this new video exhibition space. Among the visionary video works to be featured would be the debut pieces by Bill Viola ’71, then an SU student and today one of world’s leading video artists. 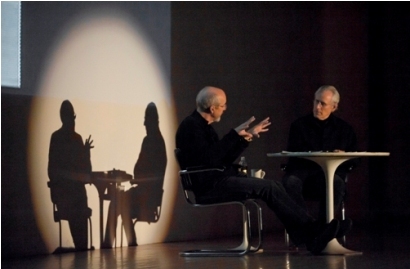 Both Viola and Ross were instrumental in cultivating the Everson’s place in the history of video art, and on a global level, the establishment of video as a vital form of contemporary art. Now, nearly 40 years later, the latest chapter in this local artistic history has seen Viola and Ross reunite at the Everson for a special event, “Bill Viola in Conversation with David Ross,” and the celebration of the Viola’s “The Quintet of the Astonished,” a video installation now projected on the outside of the Everson, through Oct. 30 as part of the Urban Video Project (UVP). The UVP is a multi-media public art initiative of Light Work and Syracuse University that celebrates the arts and culture of Syracuse and engages artists and the creative community around the world. 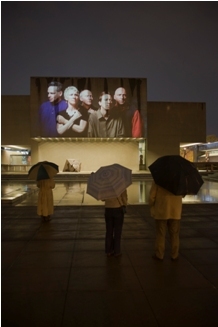 “The Quintet of the Astonished” marks the launch of the Everson Museum as a new UVP site, with the north face of the museum on community plaza serving as the screen. The UVP has three permanent projection sites throughout the city that with continue to exhibit the work of artists throughout the year. In the past public art has been defined by static sculptures, murals, and installations. Utilizing new technology, the UVP is helping public art become alive and interactive. Viola’s “The Quintet of the Astonished” shows the unfolding expressions of five actors in such extreme slow motion that every minute detail of their changing facial expressions and movements can be detected. Viola’s emotionally charged slow-motion videos address universal themes of birth, death, human suffering and spirituality. He uses slow motion to stretch time, allowing viewers to discover the deeper meanings of the complex image world that slowly unfolds before them. For 40 years, Viola has created video tapes, architectural video installations, sound environments, electronic music performances, flat panel video pieces and works for television broadcast. His work has been shown worldwide and is in the collections of many distinguished institutions. In 1995, he represented the United States at the Venice Biennale, and several large survey exhibitions of his work have toured internationally. He is the recipient of numerous awards and honors, including a John D. and Catherine T. MacArthur Foundation Fellowship in 1989. He was inducted into the American Academy of Arts and Sciences in 2000. In 2006, he was awarded Commander of the Order of the Arts and Letters by the French Government and in 2009 he received the Eugene McDermott Award in the Arts from MIT. He completed his bachelor of fine arts degree in experimental studios at SU’s College of Visual and Performing Arts in 1973. Ross has a 40-year career as an art museum professional and educator, and has held curatorial and senior leadership positions at the Everson, the Long Beach Museum of Art, and the University Art Museum at UC Berkeley; and directorships at Boston’s Institute of Contemporary Art, the Whitney Museum, and at the San Francisco Museum of Modern Art. He is currently the chair of the MFA: Art Practice program at the School of Visual Arts in New York City.